Just the word "bacon" makes some people salivate at the thought of the delicious, fried, meaty treat. Not necessarily me, just some people (...including me). The taste and smell likely rank in the top two spots of bacon's vast appeal, followed by the sight of it, for those familiar enough with its deliciousness to have positive associations with it. It is for that reason that bacon on makes a good TV subject. We've seen it featured in food shows and specials before, and the pork product will take center stage in a Destination America series called The United States of Bacon. Premiering later this month, the 12-episode first season of United States of Bacon will follow Chef Todd Fisher as he road trips across the country, visiting various cities in America in search of all things bacon. From Discovery's announcement, American's eat more than 1.7 billion pounds of bacon each year, so Fisher shouldn't have much trouble seeking it out. 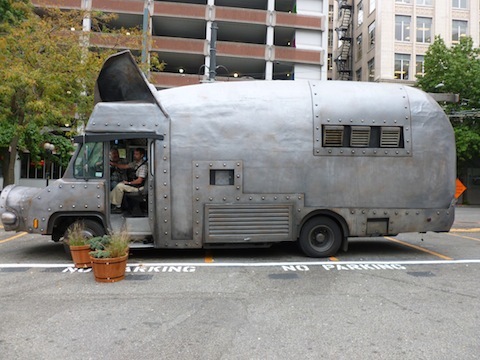 But take a look at the man's pig-tastic mode of transportation. Lest anyone wonder what he's doing in the area, the ears on that truck might give them a clue. Here are some details on the first episode, which should give you an idea of how the show will work. 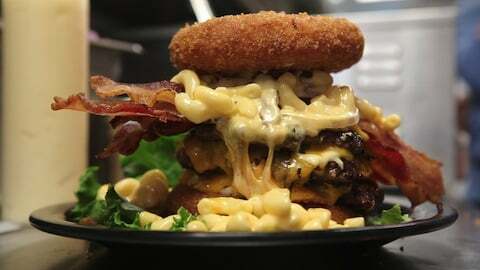 In the premiere episode at 10 PM E/P, he visits Milwaukee, a city built on meat. His first stop is to homegrown hangout AJ Bombers for the Barrie Burger, an outrageous chunky peanut butter bacon cheeseburger that’s as savory as it is sweet. Then Todd swings by Saloon on Calhoun, a local bar with a bacon love so deep that they host a daily bacon happy hour featuring bacon-wrapped pork “wings” made from juicy tenderloin. In Kenosha, Todd visits Frank’s Diner, the oldest continuously operating railcar restaurant in America, for a monstrous and meaty Garbage Platter exploding with eggs, hash browns, veggies, five different cheeses, and five kinds of meat. His final stop is the Comet Café, a small venue whose bacon-wrapped meatloaf sandwich and bacon cheddar apple pie have patrons begging for more. If the title of the series sounds familiar (beyond the obvious nod to the setting), you may have seen the three-part series United States of Food this summer, which featured a bacon special. Bacon is understandably a hit, and while Fisher is the host of this new series, bacon may be the true star. It may not look quite as good as it tastes and smells, but there is something to be said for food associations and the sight of something truly mouthwatering. For bacon lovers (and people who like fried, melty food sculptures), this image may serve as a good example of what I'm talking about. 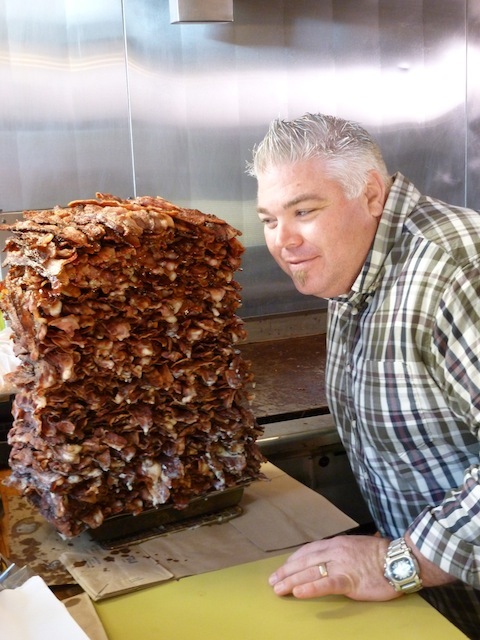 United States of Bacon is set to premiere on Destination America on Sunday, December 30 at 10 & 10:30 p.m. ET/PT.